I’ve had this blog for 2 months now. I keep thinking that I know what I want my first blog post to be about, but it’s either not interesting enough, or yummy enough, or not significant enough to be my first blog post. I had so many reasons not to post. But then. Then something happened that basically screamed “1st blog post! !” That something was cupcakepalooza. Let me back up. First of all, this is not the most typical food blog. To really get the gist of what I’m trying to do, please go to the About Me section. Any input would be tremendous. Second of all, cupcakepalooza? What is that? Well, my wonderful cousin was having a pretty smashin huge birthday party and I (crazily, stupidly?) volunteered to make the cake. For 200 people. In New Jersey. 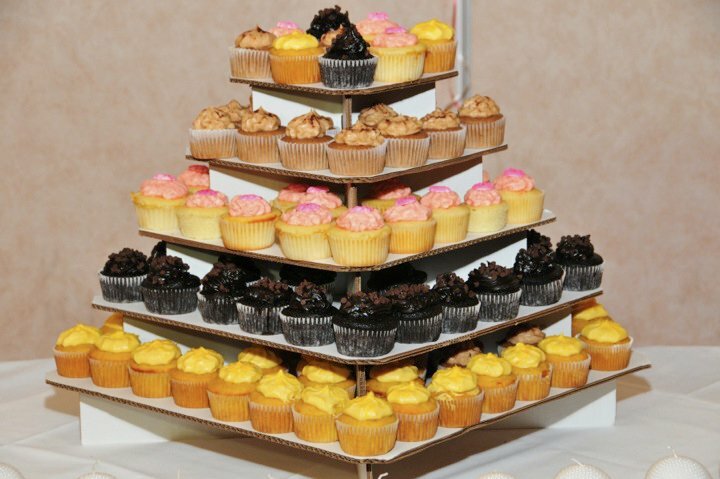 To try out the cupcake flavors beforehand, and to weed out the favorite flavors, I decided that I needed to have a cupcake party (i.e. cupcakepalooza) for some taste testing. To get some Indian flavors in the mix, I made some chai latte cupcakes with cinnamon buttercream, vanilla buttermilk cupcakes with rose buttercream, pistachio cupcakes with white chocolate buttercream and mango cupcakes with vanilla cream cheese frosting in addition to the dark chocolate cupcakes with marshmallow frosting and lemon blueberry cupcakes with lemon buttercream. 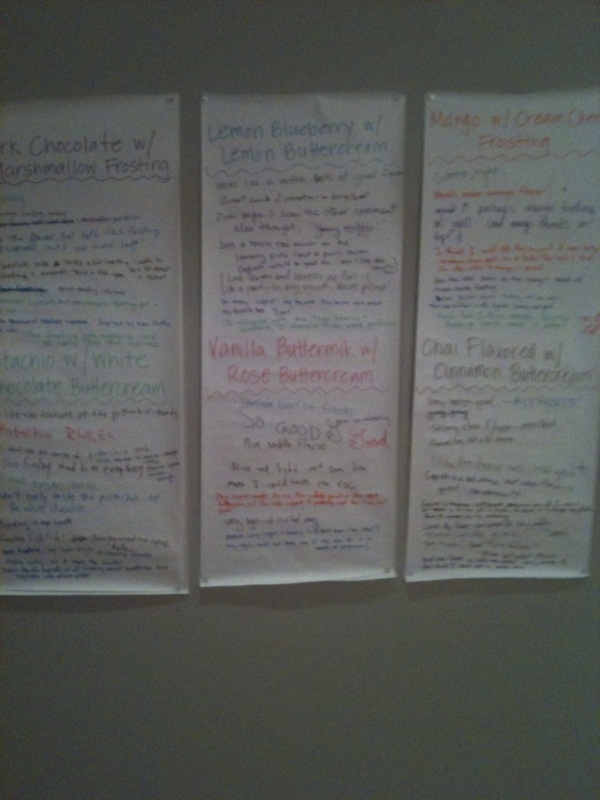 I then asked about 30 of my closest friends to come over to try and comment on all of the flavors. As it turned out, the chai cupcakes were a favorite. No changes were necessary for that cake, and it made the cut for the party. As for the others, the helpful comments included “couldn’t really taste the pistachio….or the white chocolate” for the surprisingly enough, pistachio white chocolate cupcakes, “tastes very rosy – but I don’t really know what rose is supposed to taste like,” for the vanilla buttermilk rose cupcakes, and “SO GOOD!” for the lemon blueberry cupcakes. Taking these helpful and constructive comments into consideration, I decided to change the chocolate cupcakes to include a dark chocolate frosting for the chocolate lovers, and then take it completely in an Indian direction for the rest of the cupcakes – vanilla buttermilk cupcakes with rose syrup buttercream, mango cupcakes with mango cream cheese frosting, and chai cupcakes with cinnamon buttercream. It seemed that most people thought that the light marshmallow frosting on top of the denser chocolate cupcake left a bit of an imbalance. 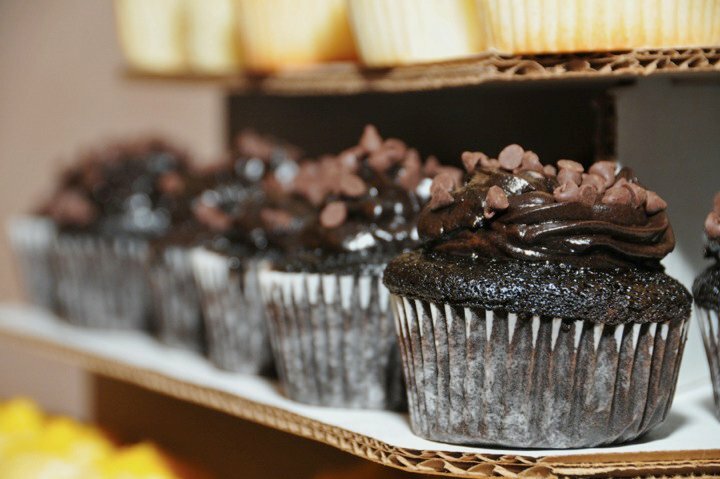 Though, overall, the chocolate cupcake was a winner – and every cupcake party should have at least one chocolate feature. 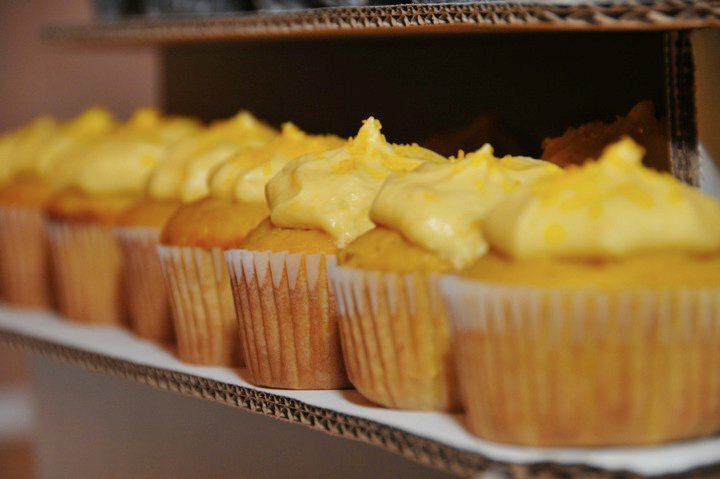 The mango cupcake was also well liked overall, but lacked some mango flavor. To pump up the volume, I tripled the amount of mango that I put into the actual cake, while also adding some pureed mango into the cream cheese frosting. The rose also needed a bit more punch. I had a hard time deciding between using rose water and rose flavored syrup in the frosting, while keeping a vanilla buttermilk base. The rose water was the only thing I used for the cupcake tasting, mostly because I thought that there would be a sweetness overload if I had used the syrup. But even though it could be slightly detected, there wasn’t a strong enough rose flavor. For the birthday party, I decided to use both. Rose water in the actual cupcake batter and rose flavored syrup in the buttercream. The party? It was a success. The transporting, the last minute frosting, the dependency on the arrival of a cupcake tier – all very stressful, but definitely worth it at the end. And, if nothing else, it inspired my first of many blog posts. I do hope that you come back here periodically to see what I’ve been cooking. I look forward to having you. 2. Stir together sugar, flour, cocoa, baking powder, baking soda and salt in large bowl. Add eggs, milk, oil and vanilla; beat on medium speed of mixer 2 minutes. Stir in boiling water (batter will be thin). 3. Line muffin cups (2-1/2 inches in diameter) with paper bake cups. Heat oven to 350°F. Fill cups 2/3 full with batter. Bake 22 to 25 minutes. Cool completely. Frost. 1. Melt butter. Stir in cocoa. 2. Alternately add powdered sugar and milk, beating to spreading consistency. Add small amount additional milk, if needed. 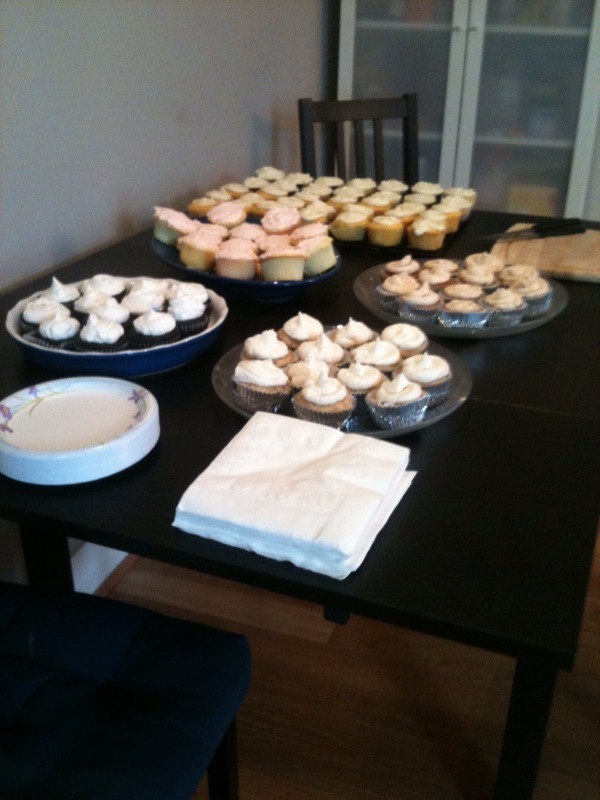 Yield: A lot of cupcakes – 40, maybe? 1. Preheat the oven to 350ºF. Line muffin tins with cupcake liners. 2. Put the flour, sugar, baking powder, and salt in a large mixer bowl. With the electric mixer on low speed, blend for 30 seconds. Add the butter and mango puree and mix to blend the ingredients. Raise the speed to medium and beat until light and fluffy, 2 to 3 minutes. 3. In another large bowl, whisk together the egg whites, milk to blend. Blend until soft peaks form. Add the whites to the batter in two or three additions, scraping down the sides of the bowl well and mixing only to incorporate after each addition. Scoop into liners – filling until about 2/3 of the way full. 4. Bake the cupcakes for about 25 minutes, or until a cake tester or wooden toothpick inserted into the center comes out clean. Take out of pans and let cool completely on wire rack. 1. In a large bowl, beat together the butter and cream cheese with an electric mixer. 2. With the mixer on low speed, add the powdered sugar a cup at a time until smooth and creamy. 3. Beat in pureed mango. 1. Preheat the oven to 325°F. Line muffin tins with cupcake liners. 3. In a smaller bowl, whisk together the whole eggs, egg yolks, vanilla, rose water and the remaining 1/3 cup buttermilk until well blended. Pour one-third of the egg mixture into the cake batter at a time, folding it in completely after each addition. 4. Fill each liner about half way (they really tend to rise). Bake for 26 to 28 minutes, or until a cake tester or wooden toothpick inserted in the center comes out clean. 5. Take out of pans and let cool completely on wire rack. 1. Whip everything together until desired consistency has been reached. times in soy milk and squeeze gently to extract any soy milk before removing. into the center comes out clean. Transfer to cooling rack and let cool completely.